I spent the day writing. Both Harp and JazzTimes took me up on concert reviews for their websites. For Harp, I reviewed Savage Republic's performance from last Friday. AND IT'S ALREADY UP ON THE SITE! Go to http://harpmagazine.com/reviews/concert_reviews/detail.cfm to check it out. Since last weekend was the big double-shot of music, I went to the Warhol Museum for the Vandermark 5 show the night after Savage Republic. I'd tell you about it, but I'd rather you read it too. Not sure when that will be up on the JT website, but you can go to http://www.jazztimes.com to see. Greg Norton from Husker Du is a band again. Or at least he's recorded a new studio project that includes the drummer of the Bad Plus Dave King, keyboardist Craig Taborn (plays with Tim Berne) and guitarist Eric Fratzke (who plays in Happy Apple w/King). It's kind of proggy and little like Beefheart at times. I'm hoping to interview Mr. Norton. Keep your fingers crossed. Last night was the New Wave Cabaret; the first one in 5 years. The 31st Street Pub was packed, which made me glad. When we got there at a little after 9, it was still fairly empty, but I guess that's because most folks didn't believe it would really start that early. It did and not only that, it ended early because everyone was good about getting on and off the stage so things were ahead of schedule. The Yes Darlings' set went over really really really well. We played the B-52's "Strobe Light," with me doing the Fred Schneider part and Hille and Aimee doing the Cindy and Kate parts. Then we did the Human League's "(Keep Feeling) Fascination" with Hille moving onto drums and Mike switching to French horn and singing. He looked really good standing with the mike and singing, and the French horn was a great idea. Amoeba Knievel was up next, which made things easy for me. Since we didn't get a chance to practice last week as a 4-piece, we were sort of winging it. Mike, Tommy & I got together last Monday and the two of them got together with Bob yesterday. Things were a little slippery but it held together pretty well, for the most part. We did Ian Dury's "Hit Me With Your Rhythm Stick" which has an absolutely crazy bass line. Man, who played that - Jaco Pastorius? Steve Swallow? It's in F, and it's hard to maneuver on the neck. But that one held together pretty well. PiL's "Rise" was a little fast to begin with and then some of the cues were a little sloppy. At the same time, we were the only ones who could pick up on that. It went over really well with the crowd. And it was the perfect song for Tommy to sing. Dadgum, it's cold. I brought a space heater up here to the office for extra warmth and blew out a fuse. So I'm going without it. And actually in here, it's not too bad. Among the legions of musicians that play in a style often called free jazz, very few of them are trombonists. AACM vet George Lewis is probably the first one that comes to mind, with Albert Mangelsdorf and Steve Swell being uncovered after further brainracking. 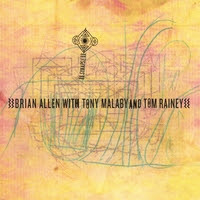 On Synapse, tenor saxophonist Tony Malaby (Paul Motian's Electric Bebop Band, among others) and drummer Tom Rainey (almost everyone, most recently with Tim Berne and Mark Feldman) join him for eight tracks that presumably were totally improvised. All three players receive writing credits and most of the albums sounds like two- and three-way conversations where moods are expressed rather than musical structures. The whole album (which lasts 50 minutes) could very well have been one continuous performance banded into separate tracks. Allen doesn't get caught up exploring his instrument's flatulent possibilities (one personal turn-off with free brass players), instead concentrating on the mid-range, with which he displays a brawny tone and a strong melodic sense even in the freer moments. Without any chordal instruments to ground them, Allen and Malaby could have easily opted for stratospheric blowing. But that doesn't come until the second half of the 12-minute closer "Espancino." Before that, they engage in a pointed dialogue ("Tageshif"), egg each other on ("Briesrock") and keep things spare to create suspense ("Tenrayle"). Rainey again proves himself to be a drummer who can both support a band and build ideas around them as they play. Steven Byram, who has designed many an a CD cover for Tim Berne, has done the same for the cover of Synapse. His unhinged style, which captures the essense of the music inside, is highly distinctive, and hopefully free fans who recognize it will be compelled grab Allen's work off the rack and check it out.